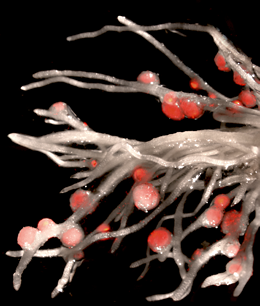 To enter into symbiosis with nitrogen-fixing bacteria, host plants reprogram their root cells. An LMU team has now identified a calcium-binding protein complex that can be persuaded to spontaneously induce the formation of root nodules. In almost all ecosystems, plant growth rates are limited by the availability of fixed nitrogen. Symbiotic interactions between plants and bacterial species that are capable of converting the nitrogen gas in the atmosphere into ammonium ions, which plants can use as a source of nitrogen, are therefore of great agronomical significance. Legumes accommodate their symbionts in special organs called root nodules, which are normally induced only if the corresponding bacteria are present in the vicinity of the roots. “In response to the presence of the symbionts, root cells respond with regular oscillations of the calcium concentration in their nuclei. These are thought to act as the signal for the root cells to enter symbiosis and initiate cell divisions to form root nodules,” says LMU geneticist Martin Parniske. Together with members of his research group, Parniske has identified a protein which plays a crucial role in translating these signals into a specific pattern of gene activity that leads to the development of root nodules. “We were able to show that a protein called CYCLOPS, whose function had remained enigmatic for many years, is involved in the redirection of cell differentiation,” says Parniske. CYCLOPS is a component of a protein complex that interprets the calcium signals and, as a consequence, activates genes required for the establishment of the symbiosis. The calcium signal is detected by another protein in the complex, a kinase enzyme that is activated by calcium ions and, as a result, transfers phosphate groups onto specific sites in the CYCLOPS protein. This phosphorylation reaction confers on CYCLOPS the ability to bind to specific nucleotide sequences in the genome, thus activating a particular set of genes. The protein products of these genes are in turn responsible for the subsequent development of root nodules.